Last night's program didn't go exactly as planned. The Qwerty lads no-showed for the second half so I, on the spot, inserted the cassette recording of last Monday's reading on campus and listened to it on the cue speaker until I could put it "on air" at an appropriate point in Leckie's introduction of poet Ken Babstock. Timing-wise, his reading worked well instead of the live interview. ¤ "Sometimes I Think" by Montreal poet Fortner Anderson. ¤ "Ode To Commemorate the World Burns Federation's First Summer School, July 2003" by Scottish poet Hamish MacDonald. ¤ "poems" by rob mclennan (from an Ottawa Poetry Podcast). ¤ "Dad and the Fridge Box" by Newfoundland poet Agnes Walsh (Brick Books). ¤ Ken Babstock reading from Airstream Land Yacht (House of Anansi Press Inc.) w/ a reading introduction by Ross Leckie (19 March 2007). 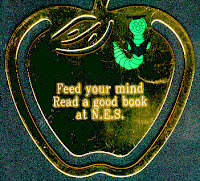 ¤ Fredericton readings news, by Joe Blades. ¤ "Husk" by poet James Deahl, music by D.C. Fitzgerald. sound: audio master CDs for the forthcoming The Time in Between by David Bergen, read by Michael Hogan and Tricia Collins (BTC Audiobooks, an imprint of Goose Lane Editions). Last night, at another reading, I was handed the index card notice below for yet another reading. This one to happen next Friday night. On Tuesday, 27 March, two of the Qwerty crew, Carson Butts and Will Leslie, will be live on the second half of Ashes, Paper & Beans (CHSR 97.9 FM). Show airs from 78 pm. Another busy arts night in Fredericton. Didn't see the production of Joseph's Amazing Technicolor Dreamcoat. Didn't go to the (to the best of my knowledge) first Fredericton reading by Governor General Literary Award-winning novelist Peter Behrens. No, I went to the 9th annual Sabat lecture . . .
. . . and I'm glad I did! By permission of him and the BAG I recorded it for broadcast on my radio showlikely in May or June (my third event recording in four nights). Peter Powning artistpotter, glassworker, sculptor, husband to writer Beth Powning (whom I interviewed several years ago for APB), father of Jake the swordsmith, photographer . 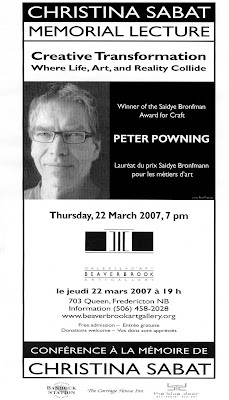 . . Peter Powning, recipient of the 30th Saidye Bronfman Award for Craft. Peter gave a great talk. Thought provoking on global issues, the earth and us as its problem, reconsideration of the local including the question of the need for one to assess the environmental impact of one's art making and ancillary practices. Bravo! This was a great talk to hear. A big obligation for all of us to take home and consider: the footprint of out lives, of our art. Peter, travelling to Fredericton on the Acadian Lines bus from Sussex, brought a box of his family's accumulated techno detritus to decorate, encrust, the otherwise ordinary gallery podium. It was great. A sad counterpoint and/or visual of points in his talk. Especially when he plugged in the xmas lights for emphasis. 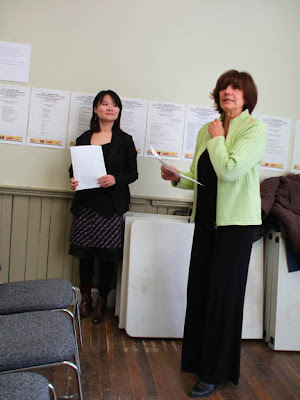 Janet, emcee, and Nela Rio, founder and organizer of the 7th International Multicultural-Multilingual Poetry Reading. 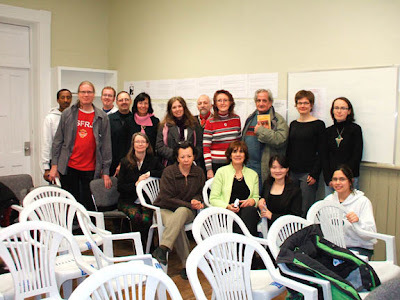 The reading & exhibit happened in the Multipurpose Room of the Charlotte Street Arts Centre. 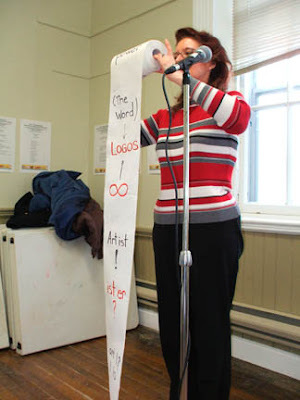 Lee Marie Dugas giving a performance piece without sound. She followed it, for the audio recording to be sent to the UN, and to be broadcast on my Ashes, Paper & Beans (CHSR)earliest possible show will be in May, by reading her text inscribed upon the roll of paper. A view down one wall of the poster poem exhibit during the reading. 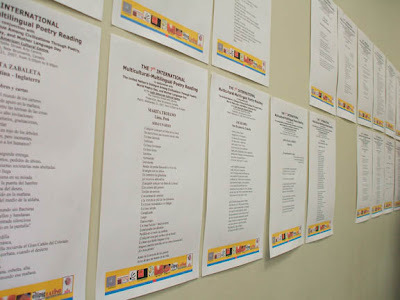 This year's celebration of World Poetry Day with a reading and poster poem exhibit featured poets and members of the community reading in many languages: Spanish, French, Portuguese, Mandarin, Japanese, English, German and Polish. Far and away, the largest number of poems were in Spanish by writers from outside of Fredericton. Group photo by Brian Atkinson taken with my camera of the stragglers after the exhibit was taken down. It was a great event. Ashes, Paper & Beans rides again! Finally, Joe went live again on CHSR. First time this year. First time since last August. Show started with a recording of Sudbury, Ontario resident, Governor General's Literary Award-winning poet & translator Robert Dickson (my Oct 2005 photo of him at right) from the 2005 Side by Side Festival. Robert just died yesterday, Monday, 19 March 2007, from brain cancer. In the second half of the show was my first broadcast of an Ottawa Poetry Podcast.  Sheri-D Wilson "From Bunhead to Bard"
 Paul Dutton "Vive le (for Henri Chopin)"
Celebrate the arrival of spring and join the friendly folks of the Shire of Lyndhaven in feast and merriment. This is the fifth annual Feast of Fools. There will be food in plenty, and entertainment for the entire family during and after the feast. If the weather permits, and there is no snow for sledding, we will have this site to ourselves the whole day, and there will be fighting outside, starting at 3pm, marshaled by Lord Isard. If it is snow there is a wonderful hill for sledding. crowning of the King or Queen of Fools. For questions, or inquires about the event or crash space contact the Autocrat: Jonathon Driscoll @ 357-7027 or email isard @ ironwolf.org For reservations, contact Amy at 422-2000 ext. 4423 or by email: tompkins.alt @ forces.gc.ca. Persons with allergies or other special food concerns are asked to inform the Autocrat or Amy when they register. T-shirt: "OAKLEY: Guaranteed to blow your socks off"
Tonight, I had intended to resume live Ashes, Paper & Beans episodes. The program director and I had exchanged several emails yesterday and today. I had selected CDs, selected several podcasts and burned them to CD, packed my bag and climbed the hill to CHSR. Scott, the PD, was at the end of the hall gold spray painting old 45s for this year's CHSR Barry Awards. They're to be presented Friday night. Nice! Turns out they just started the annual FunDrive last night (and that wasn't mentioned last week). I went into MCR to intoduce myself to the programmer before me. Put in a blank CD to record a copy of my show and was just starting to set it up, to check levels and if the cables were there and all, when Scott came in to say there was a hockey game starting at 7 pm. He'd totally forgotten to tell me beforehand. University hockey, UNB or STU, or both, I don't know, but university hockey is the reason CHSR first started its internet broadcasts. What a false start to resuming live broadcasts. Oh, well. I'll go again next Tuesday. Have three Tuesdays before I fly to Calgary (have those eTickets in hand now) and miss another two live Ashes, Paper & Beans programs. The Friday before March Break in NB public schools and universities I was upriver @ Nackawic Elementary School. 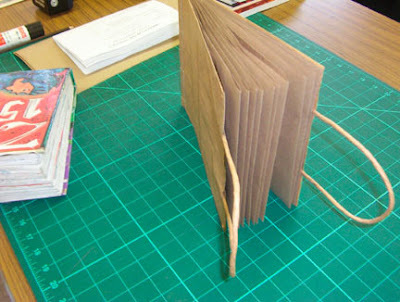 Was in Peter Gorham's art room making an artist book to leave in the school library. Was there through the province's Writers-in-the-Schools program. Main thing I did was three intense journal writing workshops to get those 60 Grade 4 & 5 students inspired to start creative journals of their own. Then we gave each of them journal (hardboard covers, lined, from Dollarama). Kick started their use by having them put their name and phone number inside the front cover. Peter offered them the use of his date stamp. Next I suggest that they get another student to write or draw something in each other's journals. Some started with collecting phone numbers. Other students wanted other kids' signatures and/or my autograph and Peter's (as their teacher). I also gave out some postcards and MAPP business cards. I saw drawings. Saw stickers being put on pages. Saw student achievement certificates, and brochures for the library being added. The challenge left with them was to write or add thing about their March Break and outside school activities. Several were to be in a hockey tournament together. Another had a curling bonspiel in Saint John. Some were travelling to visit relatives or just to see some place, take a vacation trip. On Saturday I was asked if I was interested in writing a 5-10 line poem for a Prose Sculpture / Sculpture sur prose project with which ellipse mag has aligned itself. Poem to be based upon a prose text first published since 1 January 2000. Poem due by St Patrick's Day. Poems to be translated and published in ellipse 79 in "early May." [Gulp! I'm still working on the layout of issue 78. Still haven't received cover art images. Insides haven't been proofread. Have to work some more on that today.] Cloud cover prevented me seeing the total lunar eclipse just after sunset. Unexpected personal emails await me Sunday morning. I went for a goodly long walk. Bought Faxe beer. Time spent on homolinguistic poem work and on Serbia-set "testimonial" poem writing. 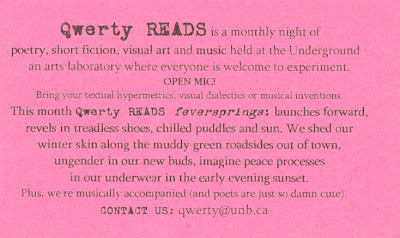 After the snowbot attack and sleep dep of early Monday morning, I sent a poem and 97-word bio note to Nela Rio for the upcoming 7th International Multicultural-Multilingual Poetry Reading (21 Match 2007) here in Fredericton. I was phoned by Suzanne at Goose Lane about the possibility of doing some contract preproduction coordination and print material prep work for their (Between the Covers) BTC Audiobooks Spring 2007 releases. We agreed to meet Tuesday morning. 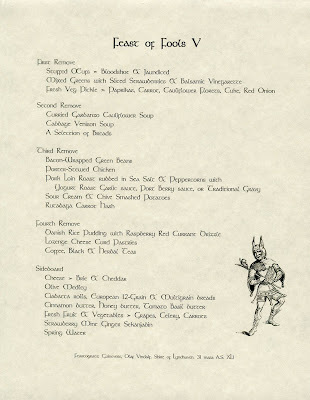 Also sent out a notice for a Feast of Fools V planning meeting on Tuesday evening. Tuesday was a biting cold day. Wind chill of -24 when I walked to recyclables to the bis on the FREX grounds and to StuporStore for Borat. 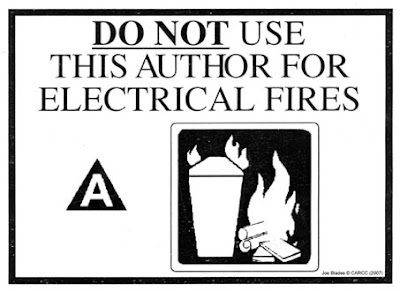 At the meeting I agreed to do the BTC Audiobooks work. Was in email correspondence with three other publishers and by phone with another after the news that Broken Jaw wasn't renewing its membership in the LPG. FoF V meeting went well. Wednesday I revised the event bid and spreadsheet before submitting then to the Shirebof Lyndhaven's seneschal. Then I answered several questions about poetry received from two Grade 10 students in Calgary and confirmed that they had Access Copyright licencing to photocopy my poem "The Dogs" for in-class use. Photographed the CFB Gagetown MAC banner. Thursday morning, I started cutting the first of my shield blanks with the jigsaw during live-death-guitar-from-the-apartment-above. Renewed my membership in CHSR with plans to resume live episodes of Ashes, Paper & Beans. Worked on the BTC intro scripts and emails to the actor-narrators. Met with Nela for follow-up from her trip to Argentina, and for upcoming event planning. That evening I rcvd an email from a poet in Edmonton inviting me to be on a panel with videopoem screening at the League of Canadian Poets PoetryFest 2007 in Edmonton in June. Checked online and found Air Can return fares starting at about $900. Would need a grant to cover that. Can I get one? Don't know but add it to the Friday "Do List." So, Friday morning, I phoned artnb to ask about their Arts by Invitation program before adding that to my work list. Got asked if I'd be willing to be on a grant jury meeting in April. It pays well. I was interested! More freelance work is a good thing. I wondered if I should look into shooting news videopoem footagemake a short onebefore PoetryFest in June? This has been a good week. Saturday, after I finally blogged about a videopoem DVD and poetry/audio art/spoken word mini-CD rcvd in the mail, I drew up a work list of things needed to support the grant applications, to extract books from the warehouse in Georgetown, to prepare for the month end Year End for BJP. Then I sketched an idea for a coif I want to sew together to wear inside my fighter helm. For one not in the school or university system, it had been a very full March Break week. Sunday morning I found a very short email from a poet friend in Calgary: "Long time no see / I have a proposition for you / Need to get in touch". Wha'sup? I wonder, before settling in to design the pattern for a MAC favour to hang off our belts. Hadn't hear anything to confirm that afternoon fighter practice would happen in Oromocto. Later I wrote emails to people scattered from Northern Michigan to Pale, Republika Srpska. Received emails from the first four actor-narrators and three sent the requested head shots and bio info. Put primer on the shield blank. Got a ph call from Liz @ Isaac's Way and went there to chat with her and Jenny. Didn't receive any further info on the "proposition". Maybe on Monday? Monday morning an email arrived from Calgary. I've known Sheri-D since the early '80s when she was working at the Clochard Gallery in Vancouver and we were both members of the Vancouver Literary Storefront (even though I lived and worked in Banff). 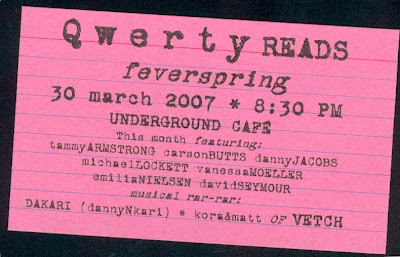 We'd last seen each other in Sept 2003 at The Word on the StreetCalgary where we read at its Poet's Corner along with Mick Burrs and poets. Her email read: "Would like to invite you to take part in / The Spoken Word Pilot Program / And SWAN (Spoken Word Arts Network) / At Banff Centre / Arrival April 08 / Departure April 19 / Unless you would like to stay / And take in the festival / Which runs until the 22". I was immediately doubtful because of the large money needed for travel, registration, accom, meals. Plus, the dates overran the artsnb jury dates, the WFNB AGM in Sackville, and the final presentation of book covers and designs by the NBCCD entrepreneurship class (but Julie, GSE Art Director, can handle that one!) I replied to the email. Suppertime I rcvd another email saying, "It's all expenses paid / All you have to do is come". That's seriously wild! Then Sheri-D phoned. We talked (interrupted by her other line). Offered me billet in Calgary for those nights. I agreed to send a photo of me and short cultural worker bio in the hope she could squeeze it into the program for the Calgary International Spoken Word Festival (design to be finalized today) and me into the festival's schedule for the days after we're in Banff. Sheri-D to buy my ticket today. Wha! Talk about fast. I respectfully bowwed out of the artnb jury duty. One way or another I'm definitely Alberta bound at least once this year. Wild and so unexpected. What a March Breakout! week for my writing and art, for Broken Joe. For me, timeliness is an important factor in attempting to give coverage of publications. Just before Christmas I read a newspaper review of a poetry book published one and one half years earlier. Here are two publications recently received. Both of these poetry recordings deal with sociopolitical issues through decidedly different approaches. While I was in Serbia in the autumn, I received several emails from Heather Haley along with word that I'd receive a copy of her latest videopoem, Purple Lipstick, in the mail. Of course, that meant that I wouldn't actually receive it or have a chance to view it until after my return . . . You can watch it online through the video's page of her website: www.hshaley.com/video1.html. Purple Lipstick addresses domestic violence through a haunting video with slow echoing guitar and voice-over by Heather Haley. The poem is from her book Sideways (Anvil Press). Purple Lipstick is a first person narrative that starts with, "I am . . . I am one of those women who wait . . . wait . . . until my husband kills me . . ."
The video has been written up elsewhere since its release and screening last year. I don't need to replicate those efforts. Suffice to say that both poem and video grabbed my attention. The video, with its effective and creative use of lighting and focus suggesting much that isn't visible, is more tightly located within the family dynamics, sometimes counterpointing images in the poem voice-over, sometimes emphasing the poem. Overall, this is a powerfull short film. 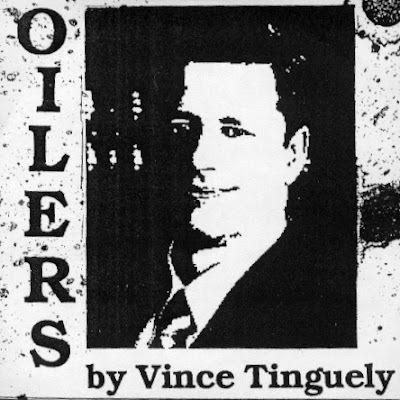 I received an envelope in the mail from Montreal poet Vince Tinguley with a copy of Oilers, his newest release, with photocopied liner notes, masking taped to a strip of corrugated cardboard. Vince is a true D-I-Y poet/artist that I've known for at least 20 years since we were both living in Halifax, Nova Scotia. He has self published several poetry chapbooks. One of his current blogs is confessions of a welfare artist. This mini-CD is available for purchase through Distroboto art-vending machines in Montreal. Oilers tackles human responsibilities towards the earth and people especially in matters of politics, and war. 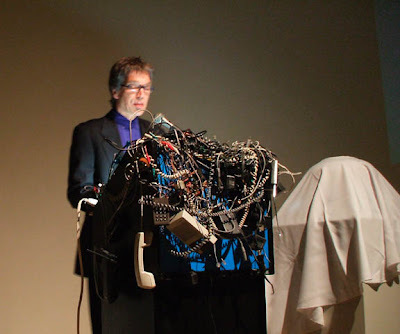 Tinguely uses not just his own writings but appropriated media sound bites and politicians reconstructed. One of the best of the bonus tracks here is a cut'n'paste reworking of Stephen Harper talking. The title track, or single, "Oilers" is a weighty 8m 15s poem about our unconscious dependence and consumption of oil, oil products, exploration and exploitation of oil resources in Canada and the world. It's a truly amazing barely-restrained, almost deadpan, rant/send-up, mixing personal tales and hard stats, about what Tinguely calls the world's biggest "drug." It must be amazing to hear this performed live but to do that would take serious consumption of oil. The nightmare finally over, half an hour after sunrise, I could almost have a beer and hope to drift into quiet day sleep . . . Started out a quiet Sunday evening and night. Many of the unibirds nesting in town have flown south or west for a break. 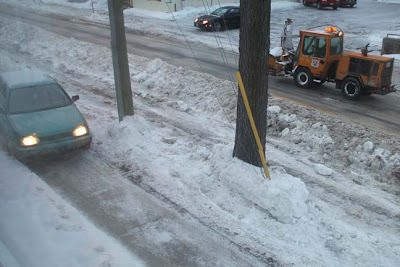 After the Friday afternoon and all-night snowstorm with the usual snowplow action in predawn Saturday, the weekend was quiet and warm enough both days to cause snowmelt. We didn't get to see the total lunar eclipse at sunset Saturday because of grey overcast promising light rain or flurries. Machines woke me. Wasn't even 3 AM. They were on York Street with their flashy gold lights, chains, and beepers to confuse. 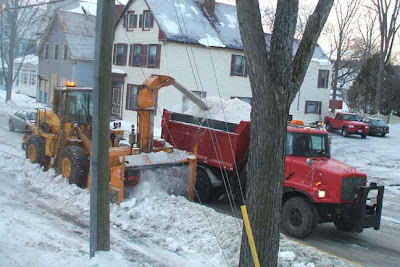 A pack of snowbots in front of the building growling and bullying snowbanks into the street in a choreographed dance. By 4 AM they'd moved away but I could here them in the distance under the waning full moon, and I didn't really fall back into sleep. In the last hour of the night they returned. It should have been quiet enough this morning, without school buses, teacher and drop-off traffic, to have slept in. The environmental cleansers were back in full force. Snarling underneath my window. Shaking the walls. People and cars caught on both sides of this shortlived barrier. The wrong people on both sides. Sorry! You can't get it! You can't get out! Once cool drivers became frustrated even panic-stricken. Some charge the snow ridge in the hope they can breach it. This one thought they could run along slide and sneak out into the open but the end was block off. 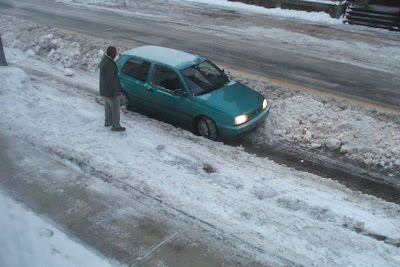 Hemmed in by snow and ice-covered curb, they had to reverse, and needed to be pushed back. Escape made down the dawn lit sidewalk just as one of the smaller snowbots hovers threatening to harry or openly attack. The voracious appetite of the beast's corkscrew mouth not even filled by the herded snow.